Tiger Woods plays the 11th hole during his final round at the BMW Championship. At last month's PGA Championship, Tiger Woods closed with a 64 to finish second. His 264 total was his lowest ever in a major. And Brooks Koepka had to set the scoring record for that major to beat him. Before this week, Woods had shot 263 or better in six PGA Tour events. Now he has done it seven times. This was the first time it wasn't good enough to get him a trophy. Woods closed with a 5-under par 65 Monday in soggy conditions at Newtown Square's Aronimink Golf Club. That left him at 17-under 263, tied for sixth with Webb Simpson (who also carded a 65), 3 out of a playoff at the BMW Championship. Woods, who started both the third and weather-delayed fourth rounds 5 off the pace at the next-to-last leg of the FedEx Cup playoffs, got to within a shot with a birdie — his fourth of seven — at the ninth hole. But he would make two bogeys on the back side, his first since the 18th in the second round. He missed good looks at birds on 15 and 17, sandwiched around a 4 on the second of the course's two par 5s. "I thought I needed to shoot something around 62 to have a chance," said Woods, who opened with a 62 on Thursday. "I might have needed 61." 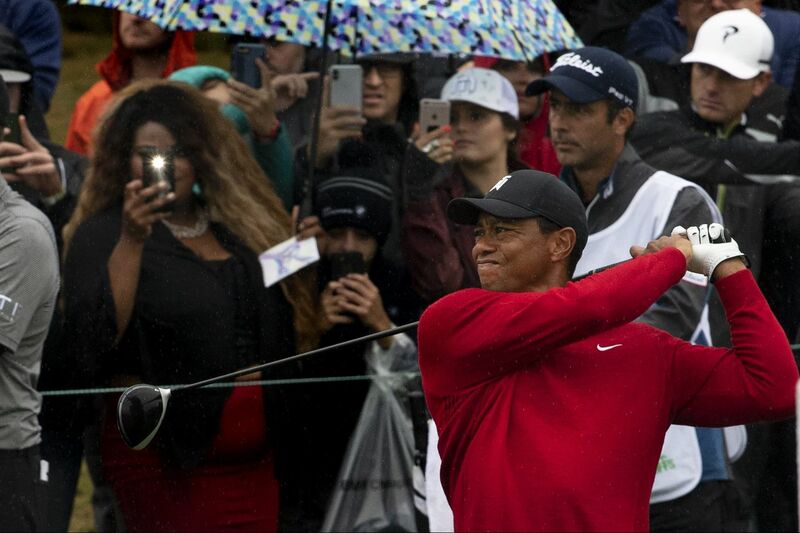 "I played a few tournaments where I was close at the end," Woods said. "To say that I made it back to the Tour Championship [in two weeks, his first appearance in five years] after what I've been through is a pretty good accomplishment." Remember, it was about this time a year ago that he said he had just begun chipping again after back surgery. Think about that. "My swing is changing, my body is changing. It's been quite a year," he said. Tiger Woods watches a shot on the third hole. And he's on the United States Ryder Cup team, as one of the four captain's picks, for the first time since 2012. But there will always be those who will have their doubts until he does hoist a trophy. Or two. "I will represent [my country] and also compete I guess as one of the top players on the tour," said the 14-time major winner, who at 42 is a decade removed from the last one. "That is something I'm very proud of. … I was just trying to play [again]." Close is one thing. Until he gets his 80th career win (he got his 79th in 2013), which would be two short of Sam Snead's all-time record, that's all it will be. His 70 on Friday made that almost impossible this week because of the conditions. That seems to be happening to him a lot. Maybe that's what happens after you miss so much time trying to put your body back together again. "It was just soft. Wasn't much of a challenge. Go after every single flag. Go ahead and do it." Sounds like a commercial in there somewhere.